Provide comfort for the family of John Strba with a meaningful gesture of sympathy. 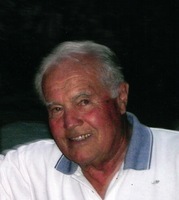 Passed peacefully in his sleep at Trillium Care Community Nursing Home, Kingston. He will be sadly missed by his wife Muriel (nee Bristow) of nearly 65 years. Loved by his children, Joe (Lilian) of North Bay, Melinda, Kimberly, Valerie (late Randy Barnes) all of Kingston, and Beverley (Marc) of Florida. Predeceased by his son John (Julie Clarke) of Oakville on February 16, 2019. Greatly missed by grandchildren David (Amanda), Jeff, Sarah (Mark) all of North Bay, Kali (Bob) of Tecumseh, Alexia (Steve) of Windsor, Niki of Kingston, Kristina of Montreal, Taylor of New Jersey, Brooke of Nashville, Courtney of Miami, Logan (Madison) of Toronto, Wilson of Kingston, and Emily of Oakville, and great granddaughters Sofia of Windsor, and Kate and Karly of Tecumseh. He also leaves behind his sister Mary Witzke of Hanover and many nieces and nephews. John retired from the OPP and enjoyed many years of fishing and hunting. The family wishes to very much thank the caring staff at Trillium Long Term Care Facility. Cremation has taken place and there will be no visitation or service. A private family graveside service will take place later at Evergreen Cemetery in Milton. If desired, donations made to the Alzheimer’s Society would be greatly appreciated. Online condolences at www.wartmanfuneralhomes.com. To send flowers in memory of John Strba, please visit our Heartfelt Sympathies Store. Provide comfort for the family of John Strba by sending flowers.